Call the nation's best biomass service engineers to get your Gilles boiler performing at its best. We enable commercial and domestic Gilles biomass boiler owners like you across the UK to maximise their income from RHI, increase the lifetime of their Gilles biomass heating system and minimise breakdown incidents. We do all of this by providing a suite of biomass services, a proactive approach and award winning service and support from our fast-growing central UK service desk team, with nationwide coverage. If you have a biomass boiler breakdown, we can provide immediate technical support over the phone and if needed arrange for a visit from one of our highly trained professional biomass service engineers across the UK. 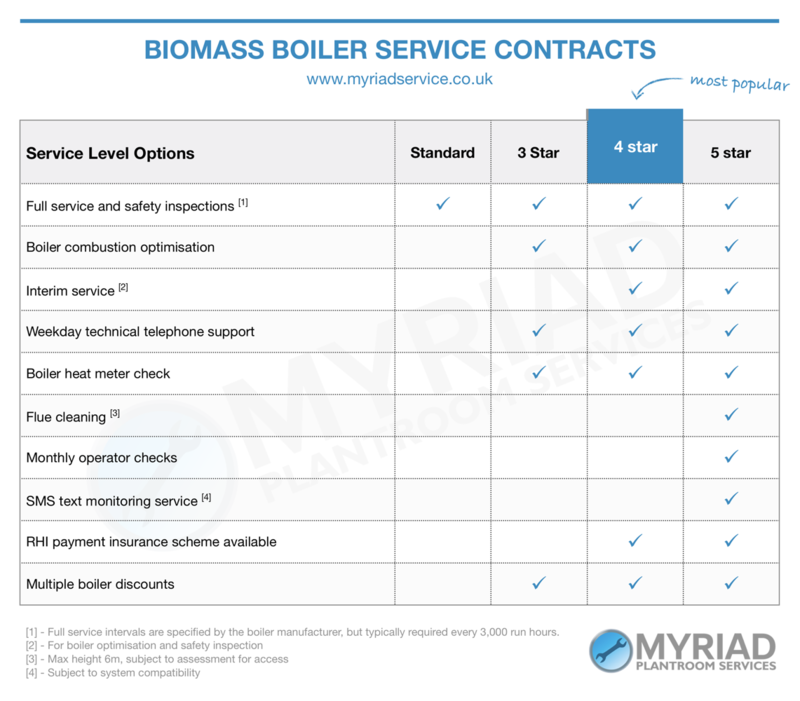 If you would like ongoing support, maintenance and servicing, you could benefit from one of our biomass service packages which are detailed in the table below. Thanks to an innovative partnership with Aston Scott, we are able to offer insurance to protect your RHI payments in the event of an equipment failure. Optimise performance, reliability and longevity. Save money now and against future services & parts. Validation of boiler warranty and peace of mind. Meet RHI service eligibility requirements. Ensure professional credibility & service. Customer responses to the question Why did you choose myriad plantroom services? Strength in depth. Reliable appointment system. We offer five tiers of servicing and maintenance contracts. Please note that the details below are indicative. Our biomass service quotes are tailored to your exact requirements in terms of the Gilles heating technology you have as well as the frequency and intensity of maintenance and support you need across your heating inventory. Each of our service contracts can be tailored to meet your specific needs. Check out our Additional Biomass Services page for the bolt-on options we offer to effectively maintain your Gilles Biomass heating system. Whilst most Gilles biomass heating systems are custom installations, there are some standardised product ranges that we regularly take care of for our clients. We also support government bodies in education, health and other public sectors areas. Our growing team of expert biomass boiler engineers is constantly being trained on new makes of equipment and different types of technology other than Gilles. Energy Efficiency - optimises the biomass boilers performance, resulting in savings of up to 35% on running costs. Longevity - Ensures the biomass boiler runs efficiently for longer by using online approved, genuine parts. Priority Scheduling - Guarantees a convenient pre-holed service visit and preference to labour dates should a breakdown occur. Technical Phone Support - Provided quick and expert biomass boiler advice over the phone, from one of our experienced technical engineers, to resolve biomass boiler issues without the need of a site visit. Spare Parts & Labour Rate Discounts - Delivers percentage discounts on spare parts and labour, depending of the service level option the client has selected. Renewal Discount - offers the possibility to receive a 5% discount if an existing contract is renewed by the expiry date.